If these walls could talk...the screams would wake the dead. Based on the chilling best-seller, this "spooky study in psychological terror" (Los Angeles Times) throws open the doors to your deepest, darkest fears! The Long Island colonial house on the river’s edge seemed perfect. Quaint, spacious and affordable, it was just what George and Kathy Lutz had been looking for. But looks can be deceiving...and their new dream home soon becomes a hellish nightmare as the walls begin to drip blood and satanic forces haunt them with sheer, unbridled evil. Now, with their lives — and their souls — in danger, the Lutzes must run as fast as they can from the home they once loved...or fall prey to its terrifying power! Starring James Brolin, Margot Kidder and Oscar®-winner Rod Steiger*, this bone-chilling, special-effects laden thriller will hit you where you live! I first saw this movie years ago on television. I had forgotten several things, but I remembered other things. The movie works as an entertaining scary movie, though for me, not a lot of what happens is scary. Flies swarming in a room is annoying to me, not scary, though it is unusual to happen in the winter. There are a few scare type moments in the movie and I did jump a bit. Even though the movie isn’t that scary overall to me, it does creep me out. The view of the house that is shown in so many shots really creeps me out for some reason. I think at least part of it is that the upper windows are shaped differently. The house just has a spooky look. The music that plays at times is very creepy sounding as well, an that got to me too. The one view of the house and the music freaked me out more than anything else in the movie, though George did get wild looking later in the movie. I did feel like there are some pacing issues since some scenes moved too slow. Some of that was probably intended to build tension, but it didn’t seem to work that well for me. I have never read the book the movie is based on, so I have no clue what has been changed. I have read and heard enough to know that the movie is supposed to be based on real events and that there has been some controversy over the years about how much is true and how much is ..embellished for the movie. I honestly don’t know what to believe about the events, but it does make for an entertaining movie. The characters aren’t developed a lot, though they still manage to be interesting. I think the cast did fine with the parts. Overall I enjoyed the movie. Hmm...something is messing up some of my color coding. I tried fixing it, but it is still messed up. It was your < i > tag to make the italics. You should have used the opening < i > and closing < /i > (using square brackets without spaces. The same as for the Bold). I already fixed it. But I wasn't trying to use italics there. I just wanted it bold and in blue, like I have been doing. I have it set up in the profiler thing in the one add on - custom trading poster I think it is - to do that, and it has worked fine until now. I haven't changed anything in the set up for it either. Weird. It's from the Overview in DVDP. The "In The Heat of the Night" title is in italics in DVD Profiler and uses the < i > style of tags, which was causing problems with the rest of your post, throwing off the color tag. I decided I was in the mood for something a little more light hearted and silly after watching The Amityville Horror. The movie is clearly a take on Frankenstein and Bride of Frankenstein. The plot is similar to the earlier movies but it still has enough other stuff going on to keep the movie interesting without being completely predictable. There is a decent amount of humor that works well even though some if it is silly. Nothing too violent happens during the movie and it isn’t too scary either. It is more family friendly, though some things might upset younger children. The cast does well with their parts. Overall, this is a fun, entertaining movie. I haven't seen that one. Someone at Epinions mentioned liking that one more as well. I'll probably track it down some day. The case for my copy says there are extras..including a commentary by some doctor, but there is no option on the menu screen for extras, so I couldn't get to them. I didn’t see this movie for the first time until about 6 years ago even though I had heard some about it before then. I’m still not sure why I waited so long to watch the movie. It has become one of my favorite vampire movies. I think the plot is interesting and entertaining and the few surprises work well. The plot moves at a decent pace, never seeming to be too slow or too fast. There isn’t a lot of action or violence to what is going on, but it is still very entertaining. The characters were all interesting and developed enough for what was going on. Some of the things that happen and some of the lines are a bit corny, but the movie is still worth watching. This is a very entertaining movie that I really enjoy. I did get a review posted on Epinions last year. Marie, I've been curious - does it help your rating and increase your earnings if we go to Epinions? I usually just read your posts here but, if it will help you, I will read your posts there instead. Is there something special I would have to do other than just read? Three modern-day "witches" (Cher, Susan Sarandon and Michelle Pfeiffer) yearn for Mr. Right in a New England town. Is the arrival of wealthy and irresistible Daryl Van Horne (Nicholson) a coincidence — or the women's unconscious sorcery at work? Based on John Updike's bestseller, The Witches of Eastwick is a star-bright otherworldly delight. † ForWitches of Eastwick, Ironweed and Broadcast News. 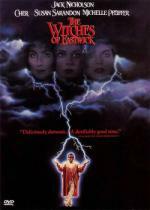 †† ForThe Witches of Eastwick and Ironweed; co-winner with Steve Martin. ††† Best Actor (1975) for One Flew over the Cuckoo's Nest and Best Supporting Actor (1983) for Terms of Endearment. I know this one really isn’t horror, but I like watching it every year around Halloween. I think it is a very interesting and entertaining movie. The movie is fun and entertaining with a decent amount of supernatural stuff going on. The plot is a bit more complicated than it seems at first. I’ve never read the book that the movie is based on, so I have no idea how much has been changed for the movie. There is some comedy in the movie, though it is more black comedy and a bit twisted at times. That works well for the movie, though that type of humor won’t appeal to some viewers. I do think there is a little bit of mystery to what is going on, which helps to keep things interesting. Some disturbing things happen at times and one part involves a lot of snakes which completely freaks me out since I’m terrified of snakes. The characters are interesting and I think the cast does a really good job with their parts. This is a good movie that is worth watching, though it won’t appeal to some people. It would give my reviews more page views, which could make me move up in the rankings as a popular reviewer. I think it might help the earnings too, though I'm not sure how that is figured. I've heard people say that clicking on an ad on the page would help with that, but I honestly don't know. Just clicking the links I post here would could for a page view and help with that. I don't know if clicking on an ad on the review page would do anything for earnings or not.